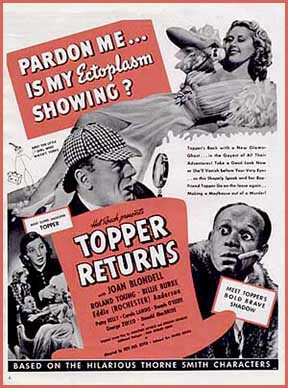 Topper Returns (1941) was the third and final "Topper" movie starring Roland Young as henpecked husband Cosmo Topper, even though the fine British character actor never got better than second billing on any of the three films. The first, Topper (1937), starring Constance Bennett and Cary Grant, was producer Hal Roach's first real bid into A-picture production, his small Culver City studio known mainly for short comedies and modest feature films starring Laurel & Hardy, among others. That film was well-received, but Roach was unhappy with MGM's distribution and advertising, and released all his product thereafter through United Artists, including the first Topper sequel, Topper Takes a Trip (1938), reuniting Young with Constance Bennett but not Cary Grant: in that short time he had far eclipsed Bennett on the Hollywood star scale. For Topper Returns, Bennett's character was also dropped, and Joan Blondell took top billing. She'd left a starring career at Warner Bros. in 1939, was entering middle age, yet not quite the character star she'd later evolve into. Topper Returns, unlike its predecessors, fell into the public domain when its copyright wasn't properly renewed back in 1969. For this reason it's been widely available ever since. It was one of the first movies released to Betamax and VHS tape, and was sold to collectors back in the heyday of 16mm. That's how I first saw it, back in the 1970s, and like many it was my first and still favorite of the three Topper films. In upstate New York, a capped assassin, dressed in black and his face covered, shoots at a taxicab, crashing it and nearly sending it over a perilous cliffside. Uninjured, Ann Carrington (Carole Landis) and her friend, Gail Richards (Blondell), hitchhike from there, imposing themselves upon a reluctant meek banker Cosmo Topper (Young) and his chauffeur, Eddie (Eddie "Rochester" Anderson). At the palatial but creepy Carrington estate, Ann is introduced to her invalid father, Henry (H.B. Warner), whom Ann hasn't seen since childhood. With Henry infirm and Ann poised to inherit the estate since the death of Ann's mother in a Sumatra mining accident (! ), she and Gail settle in to the strange surroundings. The young women also meet Henry's physician, the suspicious-acting Dr. Jeris (George Zucco) and the creepy housemaid, Lillian (Rafaea Ottiano, of Devil-Doll). Ann and Gail decide to switch bedrooms at the last-minute, and that night the caped assassin, mistaking Gail for Ann, fatally stabs the former. Now a ghost, Gail makes a beeline for the home of Cosmo Topper (instinctively aware of his previous encounters with ghosts George and Marion Kerby, Grant and Bennett from the previous films?). Begrudgingly, Topper agrees to accompany Gail's spirit back to the Carrington's estate to investigate her untimely death. Topper Returns was one of Hal Roach's last full-blown features. For a time he made "streamliners," short features running about 50 minutes apiece, until the middle of 1943, but by then the Roach lot had been turned over to the military for the production of training films, though Roach returned to the format briefly in 1947-48, then effectively left the theatrical film business and converted his studio for television production, and as a rental lot. The movie is enormous fun, one of Roach's best comedies not to feature any of his usual roster of comedy stars, save for Patsy Kelly, who has a small role as the Toppers' housemaid/cook. More reactive than wisecracking, Kelly is funny in that underdeveloped part. Overall, it's savvy, wonderfully atmospheric blend of manor house murder mystery and comedy-fantasy, its screenplay credited to crime novelist Jonathan Latimer, who later wrote the screenplays for The Glass Key, The Big Clock, and others. The interior sets are extremely lavish by Roach Studio standards; they're so big, I suspect they were built for some other film. Beyond the always charming Young and energetic Blondell, Carole Landis, then under contract with Roach, is fine in her ingenue part, while Billie Burke provides her reliably flighty energy as Cosmo's dingbat wife. Warner, Zucco, and Ottiano are appropriately suspicious, while Eddie Anderson makes several in-joke references to his long-running character on The Jack Benny Program. Dennis O'Keefe, mostly known for Western and action films (and later film noir) provides a nice showcase for his considerable talent in comedy parts, here as a beleaguered cabbie. Donald McBride, naturally, plays a flustered police sergeant investigating the murder. VCI's Blu-ray of Topper Returns is generally good, not outstanding. The label has a long history of problematic high-def releases, but this one turned out okay, the 1.37:1 standard, black-and-white image less tinkered with than usual for the label. Likewise the DTS-HD Master Audio 2.0 mono is fine. The lone Extra Feature is a trailer. A fun family film that holds up well today, Topper Returns is Highly Recommended.